For the past week or so we’ve had a very strong-willed male Ruby-Throated Hummingbird defending one of our feeders. We have this particular feeder sitting on the deck rail, so he’s decided the wire hanger makes the perfect place for protecting his precious food. In this image he’d just puffed up his feathers after stretching his wings. He’s obviously quite comfortable on this perch and even defends his place when we sit outside on the deck in the evenings. After he dive-bombs us and squeaks his warnings, he’ll take his place on the feeder or a nearby tree branch and watch our every move. In an effort to read more about these wonderful birds, I checked out one of my favorite websites tonight: The Cornell Lab of Ornithology. Their list of facts about Ruby-Throated Hummingbirds includes a few that I didn’t know. 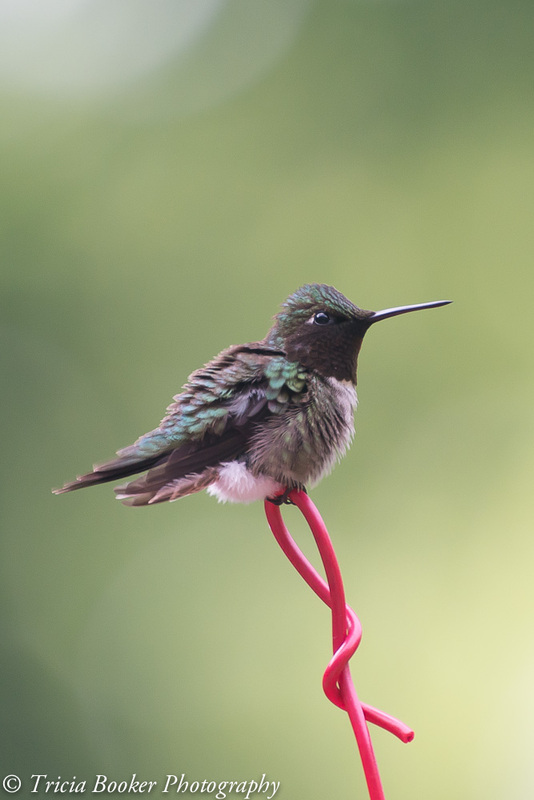 The Ruby-throated Hummingbird does not show a strong preference for any particular color of feeder. Instead, it prefers specific feeder locations. This male doesn’t always chase away the female that uses the feeders, so perhaps she’s his mate. Or, he had an equally strong mother who taught him good manners! Beautiful photo Tricia! I love to see them fluffing their feathers. We have one or two visiting so far this summer. A very excellent shot. Like seeing how you captured the fine detail of his feathers. Interesting facts and a wonderful story and photo. Since we moved from the woods we haven’t seen any yet this year. Plenty of swifts though. Thanks for sharing! In my post today I’ve nominated you for the Shine On! Award. Even if you have an award-free blog, you deserve the recognition. Thank you so much, Sally! I really appreciate the honor! Beautiful shot! I just love hummingbirds. They provide so much entertainment and fun.